Volunteer Info : Pets On Wheels Of Delmarva, Inc. Volunteers are guided in the selection of a facility appropriate for them and their pets by the coordinator of volunteers for their area. The volunteer/pet team visits the facility regularly, ideally on a weekly or monthly basis, as best suits the volunteer team. 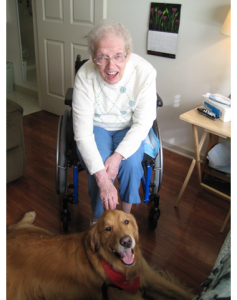 These friendly visits are most welcomed by the residents and their care givers and anticipated by all. Friendships are formed and volunteers create a bright spot in a resident’s day. At the Annual Meeting in April each year, officers are elected, new Board of Directors members are introduced, the Annual Report is presented, and our volunteers are recognized and thanked for their commitment. Our pets are thanked, too, with treats and new toys. Speakers at the Annual Meeting have included a Maryland Natural Resources Police officer with her search and rescue dog; a Guiding Eyes for the Blind puppy evaluator with her retired dog accompanied by a blind woman with her working dog; and two local dog training specialists who gave demonstrations with a dog. Workshops are held to provide volunteers with the various tools they will need to enable them to carry out our mission. A recent workshop, presented by the ARC of Maryland, showed volunteers how to better interact with handicapped patients and residents. In another workshop, volunteers met with caregivers from a facility and were helped to better understand the lifestyle of patients and residents. We also take advantage of opportunities for our volunteers to attend weekend seminars and workshops. This enables our volunteers and their pets to interact with other volunteers and instructors from all over the country, which enriches the volunteer/team experience. Volunteers are given identification badges, tote bags, and scarves, with our logo, for their pets which signify that they represent our group. Pets on Wheels of Delmarva carries more than adequate insurance on all it’s certified volunteers. Copyright © 2019 Pets On Wheels Of Delmarva, Inc. - Serving The Delmarva Peninsula.